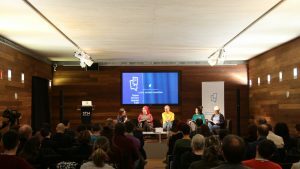 The council of social entities for the Basque language (Kontseilua) has presented the results from joint work by numerous social organizations stemming from the formal presentation in Donostia of the Protocol to Ensure Language Rights. The presentation took place at Donostia’s San Telmo Museum. Over eighty entities contributed to the process, and the presentation reflected that diversity, with participants including Amagoia Osinalde from Urtxintxa School, Josu Waliño from the PuntuEus foundation, the Basque language official of Sortzen Olatz Egiguren and the Basque language official of the LAB trade union Amaia Aurrekoetxea. Paul Bilbao, the secretary general of Kontseilua, recalled that the majority of trade unions gave their support to the Protocol in May, 2017. The past year’s work has consisted of detailing the characteristics of each measure proposed by the Protocol; what is involved in the implementation of each measure; and what prior conditions need to be met. The result is a specification of how to apply the measures to Basque. Osinalde spoke about how the process contributes to diagnosing the situation in areas such as leisure activities. Waliño noted that this has helped with the identification of priorities in the digital domain and determining what needs urgent attention in Euskal Herria. He pointed out that some measures can be implemented quickly when the will exists, such as using Basque-language software. The Protocol is based on rights, and the proposed measures aim to ensure that those rights are honoured. The Development procedure takes up the questions of how each measure should be understood, what its implementation achieves, and so on. Egiguren explained that the process helps to pin things down, and is useful for dealing with a variety of situations. Aurrekoetxea observed that the Protocol covers the whole work domain and is based on democratic rights. The general secretary of Kontseilua called on the public administrations to implement a holistic, integrating perspective at this time when there is talk of redefining language policies. “The development of the Protocol for Euskal Herria will help that to happen,” he said. He ended by underlining the importance of working together and of the fact that representatives of different sectors have taken part together with bodies whose focus is language normalization.